I thought I would try something new this week. 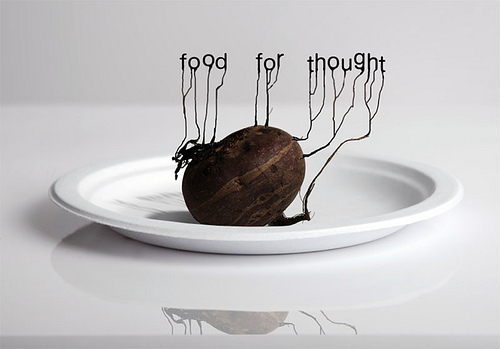 I’ve always meant to include other media besides blogs on our “Food for Thought” posts. It just so happens that this week there are a couple of significant contributions from the organic church world that I think are worth taking a look at. Let me know if you find any of these helpful in the comments section, and if people find them helpful I may try to find more. Enjoy! Plant a Church in His Projects? Kieth @ the Subversive1 blog has been tearing up the internets with a series of articles on how to minister to the poor. Alan @ The Assembling of the Church references that post in this blog and he quotes a song by LeCrae that illustrates why church planting among the homeless and poor is absolutely necessary. Shawn is a prophetic voice that has been pioneering a church in L.A. amongst the creative community there. He’s been posting at Shawnbolz’s Weblog about the difficulties of pioneering, and this post talks about the difficulty of continuing to walk in breakthough throughout our everyday lives. Len at Next Reformation has been thinking deeply about Ephesians chapter 4. Here he quotes various authors’ and thinkers’ thoughts on the realities found in Ephesians 4. What I love about these quotes is how they tie weakness and vulnerability together with displaying the glory of Jesus. Neil Cole teaches on the true place of the five ministry gifts listed in Ephesians 4. I love Neil’s emphasis on Christ as the source of all the gifts. There’s a lot to be learned here.